Brian S Hall is a technology journalist who has written for Macworld, Tom's Guide, GigaOm, and Forbes, covering bitcoin, blockchain, and social media. Wednesdays, am I right? Middle of the work week. Monday was so long ago but Friday is still so far away. It's no surprise Wednesday memes are so popular. A 'meme' is a widely and often rapidly transmitted opinion, almost always expressed visually. If it's silly or pithy or sometimes just mean, and you feel compelled to share it, it's probably a meme. What Do Wednesday Memes Mean? Wednesdays occupy that odd middle space in our brain, filled with equal parts joy and dread, exhaustion mixed with a jolt of adrenaline. 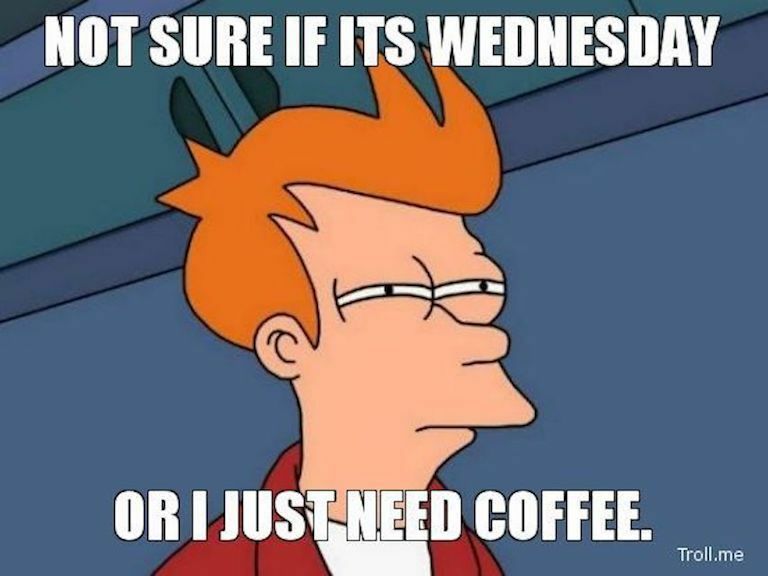 As these 14 memes reveal, most of the Internet thinks Wednesdays are bad. But if you look close enough, you'll see that some find Wednesdays the perfect justification to celebrate and indulge, and maybe also imbibe. The work week isn't even halfway over yet! Friday isn't till when? Yeah, that's Wednesday. This angry baby gets it. Yes! Only 2 more days till Friday! That's the odd thing about Wednesdays. Even the children can't agree on what Wednesday represents. But with "Success Kid" urging us on, we can make it to Friday. It's only Wednesday morning. There's so much to do and the weekend is so far away. You're going to need coffee. Lots of coffee. Somewhere along the way, Ryan Gosling took control over a large swath of the Internet, so naturally, there's a Ryan Gosling Wednesday meme. Look, it's Wednesday. You're just gonna have to deal with it. There's work to be done. How Is It Only Wednesday (Addams)? Who understands Wednesdays better than Wednesday Addams of the Addams Family? She gets it. Wednesdays are dark. Need some lightness and humor? Good luck. Even your little puppy will find that hard to offer on a Wednesday. The upside of Wednesdays are it's a great reason to commiserate with co-workers and maybe even go out and share a drink together. Happy hour wasn't enough? Wednesday may require some serious drinking. Do not call Wednesday, hump day! Do not call Wednesday, hump day! If Wednesdays are as great as some insist, then how come Internet cats, which everyone knows reflect our collective psyche, are so repelled by the very thought? Everyone's favorite baby orangutan meme just can't with Wednesdays. But, seriously, don't let your boss or the calendar get you down. Just keep telling yourself that Wednesday really is closer to Friday than Monday. The weekend is almost here. Why Would You Ever Create an Internet Meme?